Still fresh with St. Patrick’s Day spirit and Dyngus Day delirium, we roll into spring ready to make plans. New restaurants to sample, different bars to try and an entire slate of seasonal events to add to the schedule. It’s a new season, so it’s time for another night out. This month, we’ve devised an entry-to-spring itinerary with a walkable plan so you can park your car or take the Metro, then transition on foot from spot to spot. Toss on a nice fleece, get downtown and embrace April with a night at these three Buffalo locales. Healthy and hearty Japanese cuisine flanked with in-house brewed craft beers to start an evening? Take a walk down the stairs of Pearl Street’s historic Dunn Building for both, inside one of downtown’s most clandestine escapes: Sato Brew Pub. Associated with other local Sato locales and specializing in simmering ramen and succulent skewers, the “izakaya”—or Japanese gastropub—is the only one of its kind in the city. But with rich brews like its Aggretsuko stout conceived by local beer experts and wall-mural imagery merging local icons with items of Japan’s cultural lore (see: Godzilla at Canalside), the expanse is certainly a Buffalo-branded oasis inside the downtown core. Try its chicken-based Tori Sato Ramen ($12), the coconut milk-accented Green Curry Ramen ($14) or pork belly skewers ($6) with a side of its stout-braised pork and kimchi steamed bun to start your night out. In one of the off season’s most underappreciated moves, the Buffalo Bisons made the incredibly sensible move to rename their cherished downtown stadium after its fans’ favorite hot dogs. Now, multiple generations of Herd loyalists can hammer down Sahlen’s at Sahlen—so why not get started early in the season? After dinner at Sato, stroll one block over and settle into an affordable seat for one of seven primetime April home games—the first on Friday, April 5—against the Scranton/Wilkes Barre Rail Riders (Triple-A affiliate of the New York Yankees) or Pawtucket Red Sox (Boston). Will the weather be mid-season ideal? No. You’ll probably need to gear up like it’s Bills-Jets in early November, but just being outside for baseball is a sign that summer’s on the way. 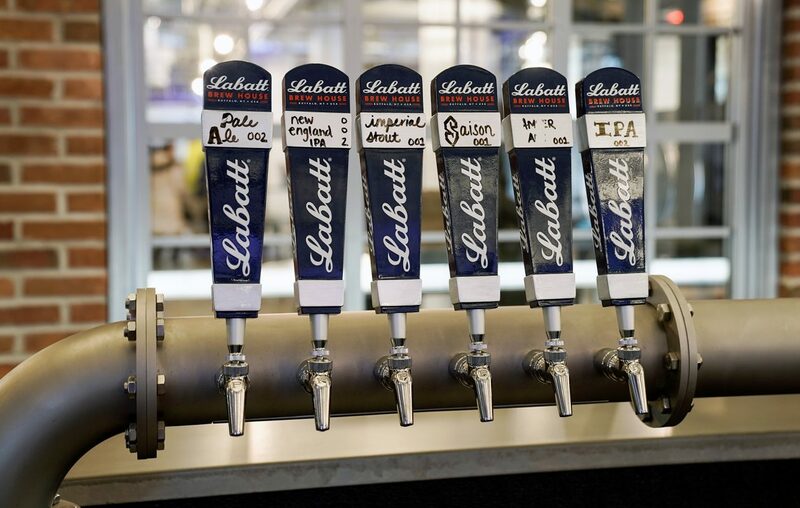 Whether the Sabres are in or out, known is that there will be playoff hockey in April…and a great place to walk and watch it is within the confines of downtown’s new Labatt Brew House. Now set inside the former Hi-Temp Fabrication building near KeyBank Center on Perry Street, the ambitious, brick-laden locale is an extension of Labatt’s U.S. headquarters, and a perfect backdrop for those interested in inhaling early round hockey with a few specialty brews. The Brew House serves as a laboratory of sorts for the brewery, so visitors can swap their usual Blue or Blue Light for the more adventurous tastes of on-tap test batches of porter, dry-hopped sours or even its New England-style IPA. And hopefully, samples of these brews can be teamed with Sabres action on the screens—and the reverberating cheers of 18,000 fans next door.